After a long day of work or physical activity, many of us could use some soothing comfort. Deep Blue® is dōTERRA's soothing solution to this challenge. Wintergreen, Camphor, Peppermint, Blue Tansy, Blue Chamomile, Helichrysum and Osmanthus work together to provide a cooling effect and can be a comforting part of a massage. For topical use only. 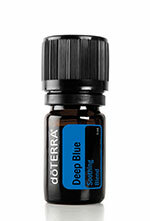 Primary Benefits Soothing and cooling oil blend Comforting part of a massage Ingredients Wintergreen, Camphor, Peppermint, Ylang Ylang, Helichrysum, Blue Tansy, Blue Chamomile, and Osmanthus Aromatic Description Minty, camphoraceous Description doTERRA Deep Blue is perfect for a soothing massage after a long day of work. Wintergreen, Camphor, Peppermint, Ylang Ylang, Helichrysum, Blue Tansy, Blue Chamomile, and Osmanthus work together to soothe and cool. After long hours on the computer, try rubbing Deep Blue proprietary blend on your fingers, wrists, shoulders, and neck. A few drops of Deep Blue Soothing Blend diluted in Fractionated Coconut Oil can be part of a cooling and comforting massage. Uses Apply on feet and knees before and after exercise. Massage Deep Blue with a few drops of carrier oil onto growing kids’ legs before bedtime. Rub Deep Blue on lower back muscles after a day of heavy lifting at work or during a move. Directions for Use Topical use: Apply to desired area. Dilute with doTERRA Fractionated Coconut Oil to minimize any skin sensitivity. Cautions Possible skin sensitivity. Keep out of reach of children. If you are pregnant, nursing, or under a doctor’s care, consult your physician. Avoid contact with eyes, inner ears, and sensitive areas. *This product has not been evaluated by the Food and Drug Administration. This product is not intended to diagnose, treat, cure or prevent any disease.